Note: The E-FSA250 has been replaced by the FX-1000 intelligent addressable panel. The Edwards Signaling E-FSA250 life safety system offers the reliability of analog/addressable fire detection for small to mid-sized applications. Built to provide years of trouble-free service, this system benefits building owners and installers with rotory device addressing, optional Ethernet® connectivity, and a full line of easy-to-configure option cards and modules. Option cards that expand system capacity and extend system capabilities. The E-FSA250 life safety system is a reliable analog/addressable solution for small to mid-sized buildings. Analog/Addressable Technology delivers the benefits of flexible system installation, while a clean and easy-to-operatate user interface makes panel operation and system maintenance quick and intuitive. The inherent fault-tolerant characteristics of Analog/Addressable Technology boosts the reliability of E-FSA250 systems. When combined with E-Series smoke and heat detectors, this system delivers a level of dependability not previously available for small to mid-sized applications. All E-Series systems are built to exacting Edwards reliability benchmarks and meet ISO 9001 standards for quality, in addition to agency listings for dependability. Two fully-programmable front panel switch/LED combinations provide an added measure of flexibility. Their slide-in labels take the mystery out of custom applications, and present a clean finished appearance. The E-FSA250 is particularly well-suited to retrofit applications. All connections are made over standard wiring – no shielded cable required. This means that in most situations existing wiring can be used to upgrade a legacy control panel to E-FSA250 technology without the expense or disruption of rewiring the entire building. E-FSA250 NACs are configurable to fully support Edwards notification appliances. These devices offer precision synchronization of strobes to UL 1971 standards. Enabling this feature allows connected horns to be silenced while strobes on the same two-wire circuit continue to flash until the panel is reset. Remote annunciation is a strong suit of the E-FSA250. Up to eight annunciators can be installed on a single system. Compatible annunciators include a range of LED and LCD models that provide zone or point annunciation, as well as common control capabilities. The E-FSA250 also supports graphic annunciation with optional Graphic Annunicator interface modules. Each interface provides common control, indicators, and 32 LEDS. Consult the Ordering Information section for details. The E-FSA250 life safety system is supported by a complete line of analog/addressable detectors, modules and related equipment. Consult the Ordering Information section for details. The front panel provides an easy-to-use operator’s interface, as well as all the necessary controls for front panel programming. A large back-lit 80-character LCD displays system status, event details, and programming prompts. Large tactile control buttons are easy to see in low light conditions, and bright multi-color LEDs offer at-a-glance status indication. Loop circuit: Maximum loop resistance: 66 ohms. Maximum loop capacitance: 0.5 microF. Style 4, 6, and 7 wiring. 64 isolators maximum. Questions to ask to help put together a bill of material for an addressable fire alarm system. Battery calculations for the E-FSA addressable fire alarm panels. This utility program is used to update the panel firmware in the E-FSA addressable panels. It works with panel firmware versions 2.2 and higher. The panel firmware itself is separate. This is version 2.31 of the E-FSA addressable panel firmware. Copy to your hard drive, then uzip. This lists what versions of the FSA-CU works with the different versions of panel firmware. These are the instructions for using the Firmware Update Utility (FUU) used with the E-FSA addressable panels. Additional instructions can be found in the Help menu of the FUU. A guide to using the FSA-CU configuration utility program with the E-FSA addressable fire alarm panels. 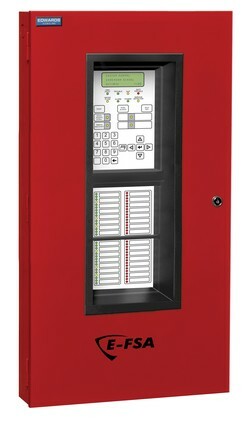 Configuration utility program for the E-FS, E-FSC, and E-FSA fire alarm panels. Copy the file to your hard drive, unzip it, then click on the FSA-CU_Setup application to install. Utility for identifing possible nuisance conditions with E-PD and E-PHD addressable detectors. For an explanation of the issue and instructions for the utility, refer to Field Notes Bulletin 13029E in the Technical Bulletins section. Information on how to configure signal circuits on the E-FSA panel to synchronize Edwards' Genesis strobes. Tips on how to wire a booster power supply to the E-FSA panels. Bulletin describing possible nuisance conditions with the E-PD and E-PHD addressable detectors and instructions for using the TF-13029 utility. Tips on how to connect a laptop running the FSA-CU configuation utility program to an E-FSA addressable panel. Tips on connecting to an E-FSA addressable panel via modem. Tips on how to do cross zoning with the E-FSA addressable panels. Wiring distances/limitations for the E-FSA addressable loop. Tips on using the FSA-CU configuration utility program for the E-FSA panel. Tips on connecting a laptop to the E-FSA panel for programming. RS232 cable connection diagram for connecting a laptop to the E-FSA panels. Trouble shooting tips for loop faults on the E-FSA panels. Tips on how to program the E-FSA addressable panel for elevator control. Technical bulletin describing an issues with the SA-DACT dialer and shared phone lines. This is a technical bulletin regarding internal device faults with E-FSA addressable panels. Bulletin explains issue and how to resolve. Tips on how to use and program latching outputs on an E-FSA addressable panel. Tips on how to program (turn on) the addressable SB4U sounder base. An explanation of a an FSA-CU error message and how to resolve. Tips on how to wire and supervise the power to SB4U addressable sounder bases. An explanation of a configuration fault caused by programming a smoke detector as a supervisory input using the FSA-CU, and how to resolve. An explanation of how to properly configure the NACs in the E-FSA panels. Describes an issue regarding using v3.3 of the FSA-CU to program a smoke detector as a supervisory non-latch device type. A cross reference list that shows what E-FSA panel firmware works with which version of the FSA-CU programming software.